The start of fall is a great time to introduce some new music into your rotation. Campus ministries and churches alike tend to feel a fresh energy as summer ends and fall begins, and new songs can add to the experience. 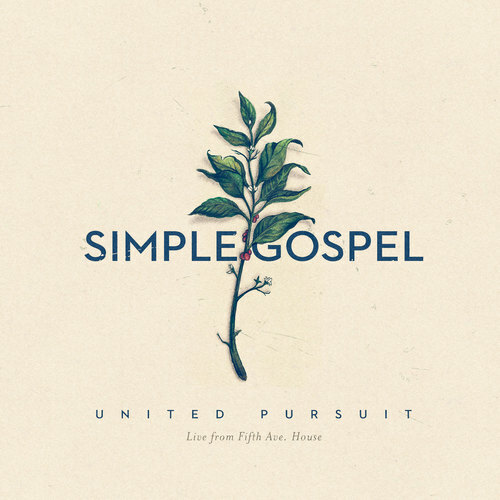 An album that I would recommend checking out is “Simple Gospel” from United Pursuit, which releases this Friday is available now! If the name United Pursuit sounds vaguely familiar, it is because you might be familiar with a couple of their songs. Band member Will Reagan wrote the songs “Set a Fire” and “Break Every Chain” which have been featured by Jesus Culture. “Simple Gospel” is a live worship album, but it is different from the large arena (or even large church auditorium) live albums you are probably used to from groups like Hillsong United. Instead, it was recorded over two nights in an old warehouse with the band set up in the round in the middle surrounded by the crowd. Their goal was to capture the intimate feel of their weekly worship gatherings (which you can stream live for free every Tuesday night). What they have done and are doing with the warehouse, which they call the Fifth Ave. House, is awesome in and of itself, turning it into both a concert/worship venue and a space of entrepreneurs to launch ideas. The instrumentation of acoustic guitars, a clean electric guitar, drums, bass, piano, and cello makes the sound much more reproducible than a Hillsong album. Instead, the challenge will come in using dynamics and space to build and shape moments, which United Pursuit does incredibly well. Like Jesus Culture, United Pursuit writes simple, singable choruses that use repetition and dynamic changes to build sets that tug on the heart and spirit. I almost think of them as “vignettes” where you sit in a moment long enough to appreciate and internalize what you’re singing and then are able to experience and express the heart of the lyrics. The songs can certainly be considered a more charismatic expression of worship, but don’t let that scare you. And as you might see in the lyric images throughout this post, you’re not going be singing deep doctrine with these songs, but you are going to encounter beautiful words and melodies that focus on our relationship with God–much like many of the Psalms. They would provide good balance in a set that joins head and heart by pairing them with rearranged hymns or more theologically dense modern songs. I spend a lot of time interacting with the written and spoken word. I read a ton for both work and pleasure, and whenever there is a task or chore that can be done with earbuds in, I have podcasts going. That is perhaps why United Pursuit’s music has been so meaningful to me. It is the other end of the pendulum. I can set aside long sentences and deep thoughts and open myself up to feeling the love, grace, and mercy of God. A few thoughts in closing. First, United Pursuit is great about making their chord sheets available. They have a chords page on their website. You can also find the lyrics and chords on the album’s page. Second, I do not have an early copy, so what you hear in the videos above, the lyrics you can read on their website, and the experience I have had with their music in the past is what has me excited. Is it a “best practice” to recommend something you haven’t listened to yet? Definitely not, but I will be sure to give it a full listen on Friday and try to add an update to the bottom of this post with some initial reactions. UPDATE: The album is out, and it is great! The structure of many of the songs make it easy to customize how long you want them to go. You can use heavy repetition and building, as they do, and get a longer experience. At the same time, you can drop in just a couple cycles and be out pretty quick. These three are featured in the videos above. They clearly know which have the broadest appeal. The track “Seasons Change” (lyrics, chords) is also growing on me, as it is a little more colorful.